Ordered August 1, shipped August 2, arrived August 5 - fast! This was my second order from Villainess and I am very pleased with everything. Its nicely packaged and shipped and just look at the cute stickers they included for me! Villainess is celebrating their 8th birthday and so the first 200 orders received birthday candles. Some of the candles had a special code with them! Banana Cream Soap - Fresh Banana and Sweet Pineapple creamed with Crisp Coconut. --A really sweet, ripe creamy banana scent. Love it! Will go great with my bungalow body butter and Sudsy's Banana cream pie body splash! Some More soap - Smokey milk chocolate, sandwiched with toasted marshmallow between cinnamon honey grahams. --Chocolatey and well mostly just chocolatey. Yummy from what I can tell, kind of difficult to smell through the shrink wrap. Supervillainess Redux - Dry woods, worn-in leather, bittersweet cacao and arabica, succulent blackberry and lime, and a salty thread of cilantro. --I don't usually buy scents with notes of leather in them, but the blackberry and lime persuaded me. I can't quite decide what I think of it. I like it but, then there's that leather note. Will have to keep sniffing and see if its one of those "acquired" scents. Blush soap slice - A blend of sweet berry and tart lime notes, grounded by a slightly tipsy touch of cheap dry wine. --I smell the berry, with what seems like something woodsy or maybe a warm floral like jasmine. I am not picking up the lime note. Its a pleasant scent, but not a favorite. Decadance - An indulgent vanilla - alcoholic, buttery and bittersweet with delightful undertones of tonka and coconut. Our favourite vice. --This soap smells a lot like another favorite fragrance of mine. I love it! 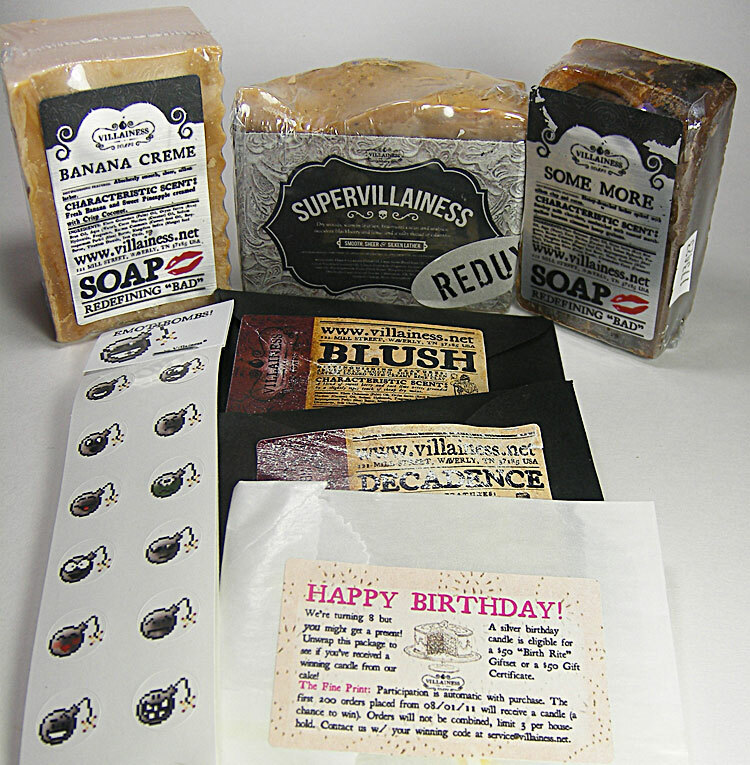 I opened up my candle and I didn't see a code, but it was fun to participate in the 8th birthday for Villainess Soaps.